Being the second member of the "M" System On Module family the M53 offers the powerful CortexA8 CPU i.MX53 . The i.MX53 family of processors represents Freescale's next generation of advanced multimedia and power-efficient implementation of the ARM Cortex™-A8 core with core processing speeds up to 1.2 GHz. It is optimized for both performance and power to meet the demands of high-end, advanced applications. Ideal for a broad range of applications in the consumer, automotive, medical and industrial markets, the i.MX53 includes an integrated display controller, full HD capability, enhanced graphics and connectivity features. 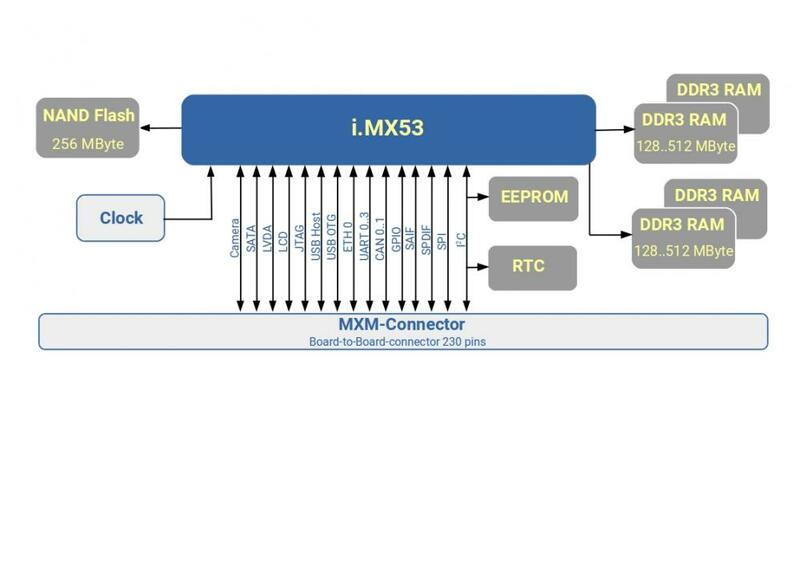 M53 is based on the popular MXM connector which is also used in a large number of "X86" embedded SOMs based on the QSeven Specification. Being a small sized and highly integrated System On Module that can be used in a design application much like an integrated circuit component it uses a 230 pin MXM2 SMT edge connector to connect all power and signal lanes to the carrier board. This connector is available from multiple vendors at different heights (5.5 mm and 7.8 mm).